With Love And A Major Organ, playing at the Toronto Fringe Festival, is a quirky love story with so much heart that it’s never too twee. 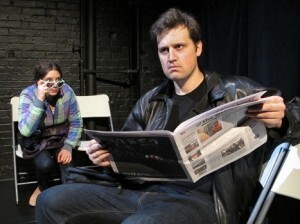 Writer Julia Lederer also plays one of the three characters, a girl obsessed with a man she sees every day on the subway. I found this really relatable, as once upon a time I had a crush on a gorgeous man I saw every day on the streetcar reading the Sheltering Sky on my way into a temp job. The girl records long messages on old-fashioned cassette tapes, full of hilarious similes about how much she loves him, then contrives to slip these tapes onto his person when he is unawares. Robin Archer plays the unsuspecting object of her adoration, and he doesn’t have much to say for the first half of the show, but when he does open his mouth he delivers very punchy punch lines, and he can send the audience into gales of laughter with just a move of an eyebrow. However, it’s in the second half when he starts delivering monologues, as he is now making his own recordings, directed to both his admirer and to his mother, that the show becomes emotionally resonant. The mother is the third character in the play, played by Martha Ross, a lovelorn woman who trusts Google more than she trusts people. I related to that as well, which would be sad except that, judging by audience reaction, I and the fictional mother are not alone. She is trying speed-dating and her failed attempts elicit sad laughter. She also opened the show with a monologue, which didn’t work so much for me: I like to get right into the action. But it did set up the story, and prepared us for the whimsical elements of the piece. I would love to see this made into a movie. There is some exchanging of internal organs that could be beautifully rendered in a Gondry-esque style. With Love And A Major Organ is playing at Venue 11 Theatre Passe Muraille Backspace, 16 Ryerson Ave.